Kanye West Hissy Fit at MTV Europe Awards Streaming Video? Thanks to an anonymous commenter for giving me this link to video of Kanye's fit, which was a little more tame than I imagined, but still like a spoiled child wanting attention during their sibling's birthday party. Kanye West went off last night after losing Best Video to Justice and Simian for "We Are Your Friends." 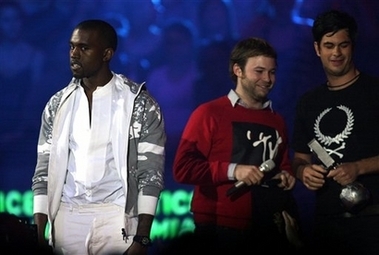 Kanye reportedly crashed the stage in Copenhagen when the award was being presented to the winners. Does anyone have a sneak peek video of Kanye West's tantrum last night when he didn't win the Best Video of the Year award and went off? Don't know if MTV will broadcast Kanye West's latest rant at the MTV Europe Music Awards, but someone's gotta have the video. (Funny, I don't see anything about it on the MTV Europe Music Awards 2006 site in the news section nor anywhere yet.) Thanks, webheads!